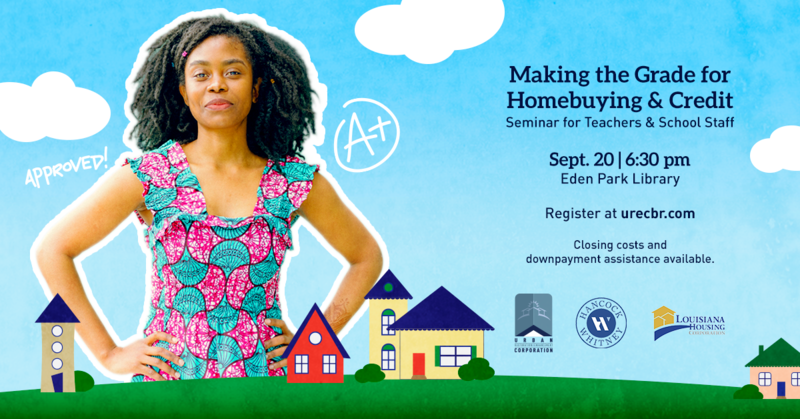 Urban Restoration Enhancement Corporation, in partnership with Hancock Whitney and Louisiana Housing Corporation, will host the Making the Grade for Homebuying & Credit Seminar for Baton Rouge area teachers and school staff on Thursday, Sept. 20, 2018, 6:30 p.m. to 8:30 p.m., at Eden Park Branch Library, 5131 Greenwell Springs Road, Baton Rouge, LA 70806. Please register here or below to attend the seminar. For more information, send an email to info@urecbr.com. Or, call (225) 356-8871. There is no cost to attend. Learn more at www.urecbr.com.